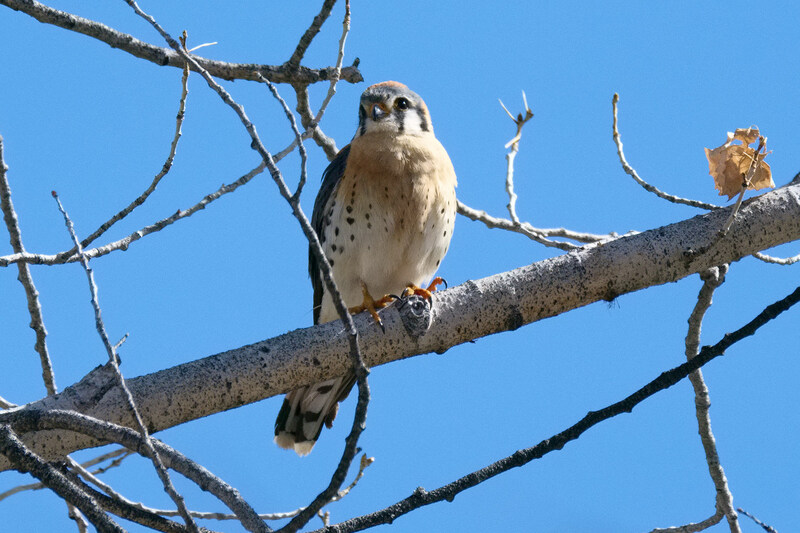 The American Kestrel (Falco sparverius) is the smallest raptor in North America. I am still waiting for my amateur radio operator’s license to be issued. My name is similar to one on an “alert list” so the automatic system pulled my application and put it in queue for review by a real person. The estimated time is weeks. To say that I am a little bummed by this outcome would be an understatement. But I have plenty to do. I am working on my station and there is a lot to do to set up an HF station. I have equipment, but antennas are an issue. I built a simple 40m dipole and erected it in my backyard. The matching transformer arrived last week (I will learn to build them as well), so I need to attach it to the mast and then tune the antenna to resonate at the middle of the 40m band. In the meantime, I just put up a random wire antenna, stapled to the top of the fence along my backyard. I ran the feed line into my workroom and attached it to my transceiver last night. Reception is better than with the previous instance and I can hear traffic on the 80m and 40m bands. The bands are not open much right now because we are at sunspot minimum and so there is not much energy to drive the ionosphere, which is where much of the long-distance propagation occurs. Morse code and the digital modes are going to be the mechanic for making contacts until the Sun becomes more active. I decided to make a real effort to learn Morse code while I wait for my license. I also will work on my portable station so I can operate away from town and all the noise here. I have plenty of access to quiet areas with elevation so low-power operation is viable. Besides that, I will get away from the house, be outside, and can camp a little. Both The Girl and I will like that. There is plenty of other work to do, too. I have a bunch of images to review and process. The little raptor above was one of my recent captures. He/she flew up near me and posed prettily while I ran the camera. The Carson River floodplain was where I saw my first Kestrel and I see them often. They are furtive, though, and do not often provide me much time to capture an image. I am enjoying the better weather lately. The Girl and I are walking the Carson River daily and the trees are about to leaf out. I hear blackbirds calling, woodpeckers drumming, and the geese are still honking. The river is up a little as the snow begins to melt and it looks like there will be abundant water this year. I heard one of the ARES members talking about releases from Lake Lahontan in anticipation of snowmelt and they are spilling excess water into the desert down near Fallon. The Girl just wandered in. She is looking for breakfast and an outing. I need to retrieve the Fuji’s batteries from the charger and prepare it for another wander. I want a bite, too, but do not feel like cooking this morning. Subway has some decent breakfast sandwiches, so I think I will wander over there and pick up something. Then we can drive out to river, enjoy some sunshine, and spend some time outdoors. Perhaps Mother Nature will bring me a treat. These license manuals occupied most of my off-time for the last several weeks. Several weeks ago I was sharing breakfast with a friend when he mentioned that he was preparing to sit the Amateur Radio Service Technician Class examination. He had purchased a software defined radio receiver and found himself an Elmer (radio slang for mentor). I was intrigued. 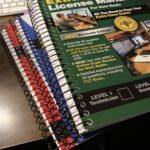 Several years ago I picked up a copy of the ARRL Technician Class license manual. It occurred to me that if the mobile telephone system were to go offline that I would have a difficult time getting word out to my family that I was alive and well. I knew that unless something deeply catastrophic occurred the amateur radio bands would be open and that I could get a message out to my family via that avenue. But, life being what it was, I set aside the manual and did not pursue the license required to operate radio equipment on the amateur bands. My friend’s revelation motivated me. “I’ll do it with you,” I said. I reflected my initial interest from a few years before. I also mentioned that I played with radios when I was a teenager and remembered something about them. I quickly learned that my license manual was out of date. I ordered a fresh copy and began working in my old copy. When the new version arrived, I picked up the thread. After a week, I decided I could probably do enough work to pass the General Class examination as well. General Class privileges include a lot more of the HF (high frequency) bands. 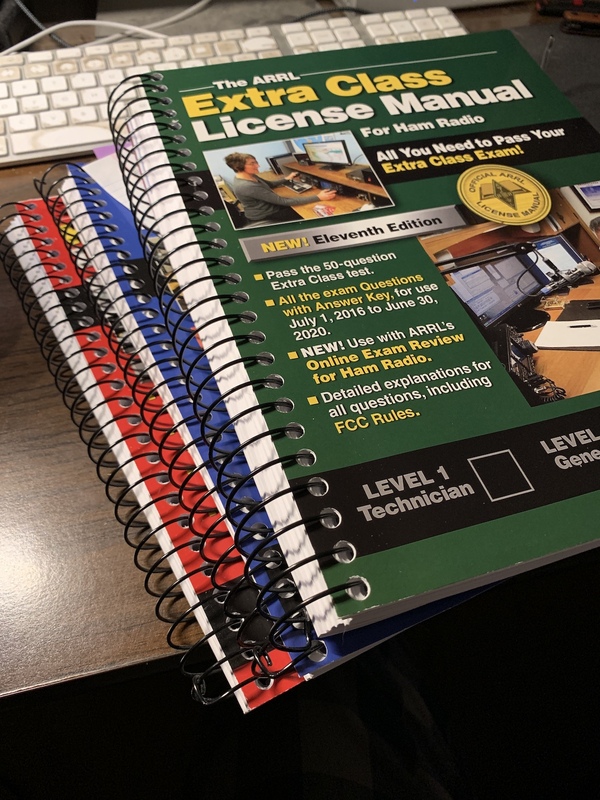 While I was buying books, I went ahead and ordered the Amateur Extra Class license manual as well. I knew that the questions were valid for another year, so I thought I would work on that after working through the other two levels. “Well, yes I am” was my response. “I might not pass all three, but I think I’m going to try.” So, my intent was logged into the club minutes. There’s nothing like a little pressure, is there? The technical level for the General class is a bit greater than the Technician level, but it was not awful. I started work on the General Class material when I started passing the Technician practice tests with scores in the 80 percent range. A couple of weeks ago I found myself passing the General Class practice tests in the 80-90 percent range. So, I thought to myself, I might as well start on the Extra Class materials. Those materials were quite a lot more technical. There was a lot of basic circuit theory, radio equipment theory, antenna theory, propagation theory, and operational policy. The Extra Class examination comprises 50 questions; the other two classes only 35. The pass rate for all of them is 74 percent. I failed my first practice examination. “I don’t know if I can be ready for this in time,” I thought. Yet, I continued plugging along, working through the material, working all the example problems, and preparing for the next practice test. I passed the next practice test. My score was not great, but it was sufficient to pass. The HamStudy website and iPad application provided a lot of practice. The app indicated that I had seen about 65 percent of the questions in the pool and my aptitude was less than 50 percent. I still had work to do and only a week to get it done. I kept after the material. Once I made it through the book, I continued using the Hamstudy flashcards and practice tests. A few days before the examination date I was passing the Amateur Extra practice tests with results in the 80–90 percent range. I stopped trying to learn new material and spent my last few days reviewing, adding to the holes in my knowledge, and practicing problems. Saturday morning, I met my friend for an early breakfast. “Are you ready?” he asked. “About as ready as I can be,” I responded. We continued chatting about the radios and the world over breakfast and then headed for the venue. We gathered with a fairly large number of other attemptees. After a few minutes, Greg, the coordinator, called us to attention and began handing out the paperwork. There were some forms to complete and then we were to hand in our forms and pay the examination fee. “There are about 12-hundred questions in that pool. There’s no way anyone could memorize that many questions,” he remarked. “Well, I studied all the material,” I responded. The first exam was distributed. I wrote my test number on my answer sheet and opened the examination. Ten minutes later I handed in my examination. Then I waited while the proctors reviewed my answers. The second proctor looked over the shoulder of my inquisitor, then gave me a thumbs up and took my answer page to check. A few minutes later I was handed the second examination (General Class) and answer sheet. I repeated the process. I spent a little more time on the General Class examination because I wanted to be sure I caught all the words. I handed it in after maybe 20 minutes. A few minutes later I received another thumbs-up. I waited for the third examination, knowing it would be more challenging. Soon I had the examination booklet and answer page in hand. Again I filled out the required information and opened the examination. I do not know how long that exam took me. I know that one of the new proctors (they had two new guys sitting in for experience) was watching me carefully. It was not that he thought I was cheating, he was curious about my approach to the work. In the 50 questions, there were some I could not remember. (Some of the material is rote memorization.) There were quite a few soft-balls in the lot that were easy to answer. There were a number that I knew, not just from remembering, but I new the material. I handed in my exam. Again, I got a thumbs-up from the second proctor as the first finished correcting my examination. I did all three classes in one sitting. I was told that does not happen often. I am an engineer. Most of my life has been spent figuring out ways to solve problems. Some of them are amenable to mathematical solution. Others require a more intuitive approach. All are based on my understanding of math, physics, and chemistry. This exercise in the Amateur Radio Service licensing examinations was no different. They were not as difficult as my engineering license exams, nor my Master or Ph.D. exams. The Extra Class examination was challenging and there was a real risk I might not pass. All I had to do was pass. Once my license is issued, then the practicals begin. I have to learn to operate the radio in real space, not in book space. I am pleased the ordeal is over. I am looking forward to the issuance of my license and call sign. Then I can operate my radios. It is fun stuff.